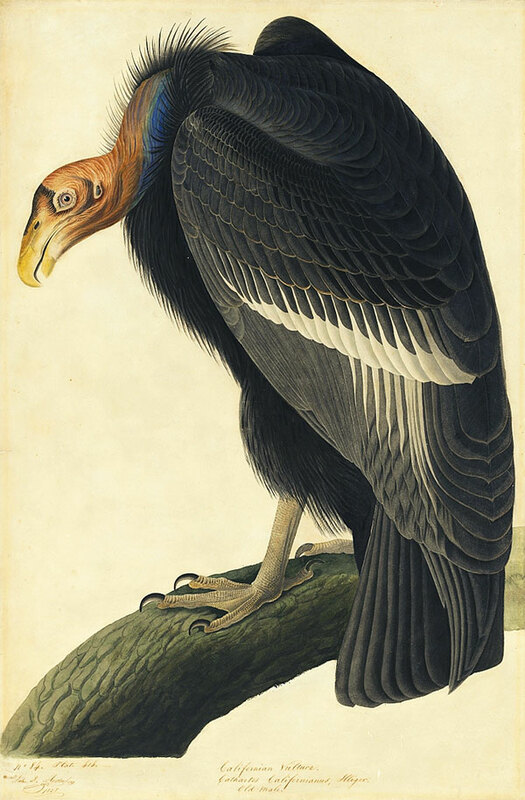 The date of 1838 in its inscription proves that Audubon painted the gigantic species―measuring over nine feet from the tips of its wings―which he called the “California Vulture,” in London from a specimen. Audubon had never observed it and depended on a description of its habits that he had solicited from Townsend, together with an account published by the naturalist David Douglas in the 1828 Zoological Journal. This sheet was the sole watercolor model that for unknown reasons was separated from the others and, therefore, not purchased from Lucy Bakewell Audubon. Rather, it returned to the flock through the generosity of its donor in 1966. This scavenger is the largest of all North American land birds. Weighing over 18 pounds with a wingspan of more than nine feet, it flourished in several western states. Lewis and Clark found condors on their expedition through the Northwest. Other explorers and settlers from Alberta to Baja California reported them in the early 1800s. The California Condor became extinct in the wild in 1987, when the last nine birds known were captured and placed in a captive-breeding recovery program. With about 125 birds reintroduced into the wild in southern and Baja California and Arizona, its population has risen slowly. In December 2007, the California Condor Recovery Program reported a population of 300, including 145 in captivity. Audubon’s 2007 WatchList places the species in its red category, in severe peril, while the federal government classifies it as “Endangered.” The bird’s survival depends on the success of the captive breeding and re-introduction programs. The bird has few natural predators, but low mortality rates often lead to even lower rates of reproduction. The variety of perils faced by Condors included collection by Native Americans, shooting by settlers, collisions with power lines, poisoning from coyote control programs, and other threats created by humans. In recent years, their consumption of animal carcasses shot with lead bullets have put these birds at risk.